The HeRO Graft can be implanted on either an inpatient or outpatient basis. However, your doctor will tell you which type of procedure would be best for you. Check with your doctor or nurse if you are not sure about beginning a new activity. Once your incisions heal, you may usually resume your normal activities; however, you must remember to protect your HeRO Graft just as you would any hemodialysis access. Will the HeRO Graft clot? 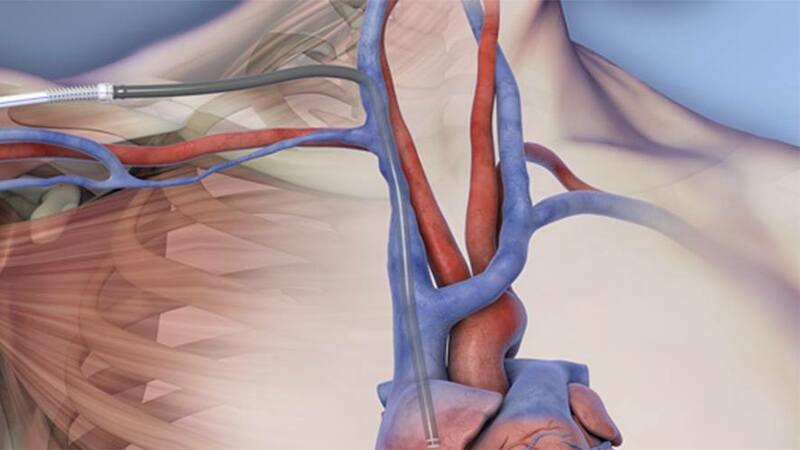 You can expect the HeRO Graft to clot with the same frequency as a standard graft and require the same type of declot intervention, which must be performed by your doctor. However, the HeRO Graft is expected to have a longer useful life and be less prone to malfunctions (fewer declots and/or exchange procedures) than a typical catheter. Do you have to use needles to access the HeRO Graft for dialysis? Yes, hemodialysis needles are used to access the HeRO Graft just like any other graft. When can I use my new HeRO Graft for hemodialysis? Grafts typically require two to four weeks for healing after the implant before they should be cannulated. Swelling should have subsided so that the graft can be felt using finger pressure. Your care team will let you know when it’s okay to begin using your new access. Who should see my Patient Identification Card? Everyone involved with your medical care should know about your HeRO Graft. If you need any procedure, such as a declot of your graft, an X-ray, or a central line placement, the doctor performing the procedure needs to know that you have a HeRO Graft. By keeping your HeRO Identification Card with you at all times you can quickly and easily give the doctor the information he/she needs. Will the HeRO Graft set off airport metal detectors? It is unlikely that the HeRO Graft will set off airport metal detectors; however, carrying your HeRO Identification Card with you should help prevent any issues. What do I need to tell my dialysis care team? You should give your dialysis care team the Care & Cannulation guide provided in the Patient Care Pouch given to you after your HeRO Graft surgery. This booklet will tell them what they need to know about the care and cannulation of your new access. What about infections compared to other accesses? After the initial healing period (2–4 weeks) and successful graft cannulation, your long-term catheter can be removed. Once the catheter is removed, the risk of infection with the HeRO Graft has been proven to be the same as with other grafts, which is significantly lower than with long-term catheters. Can I shower or swim? Be sure to check with your doctor for advice on when you can resume your normal activities. However since the HeRO Graft is fully implanted under your skin, you may usually shower and/or swim after your incisions have healed. Contact customer service through the form below or call 800-356-3748 with any question you may have.